Lifesaving Resources to conduct its 20th annual INTERNATIONAL ICE RESCUE INSTRUCTOR ACADEMY, February 21 - 24 in Portland, Maine. Participants from New Jersey, Maryland, Virginia, Massachusetts, New York, Vermont, Rhode Island, New Hampshire, Maine and parts of Canada will be participating in this intensive 4-day boot-camp-style training program. For more information, please access the Lifesaving Resources' website at www.lifesaving.com, or call 207/967-8614. Lifesaving Resources (www.lifesaving.com) is a private company dedicated to drowning and aquatic injury prevention and emergency management. Located in Kennebunkport, Maine, Lifesaving Resources is recognized both nationally and internationally as a leader in Ice and Water Rescue training programs for First Responders. 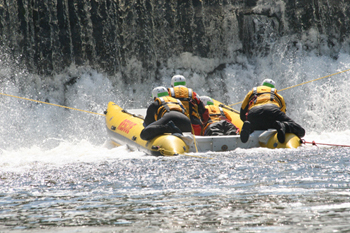 The company develops educational programs in Water Rescue, Swiftwater Rescue, Ice Rescue, Lifeguarding, Drowning Prevention and Aquatics Safety, and conducts this training throughout North America as well as Internationally. The company conducts an annual INTERNATIONAL ICE RESCUE TRAIN-THE-TRAINER ACADEMY, as well as an INTERNATIONAL WATER RESCUE TRAIN-THE-TRAINER ACADEMY. The purpose of these internationally-recognized Academies is to train and authorize Ice and Water Rescue Instructors for Fire, Rescue, EMS, and Law Enforcement agencies. For information on any of their programs, please access their website at www.lifesaving.com.